In large nonmetal bowl, mix thyme, brown sugar, garlic, allspice, salt, vinegar and pepper sauce. Add chicken drummettes; toss to coat evenly. Cover; refrigerate 1 hour to marinate. Heat oven to 425°F. Line two 15x10x1-inch pans with foil; spray foil with cooking spray. Place chicken drummettes in pans; discard any remaining marinade. Bake 45 minutes or until chicken is no longer pink next to bone. Meanwhile, in small bowl, mix all Dipping Sauce ingredients. Serve chicken wings with sauce. To make ahead, make and bake drummettes as directed in recipe. Place in covered container; refrigerate up to 24 hours. To reheat, place in foil-lined 15x10x1-inch pan; heat at 350ºF until thoroughly heated, about 20 minutes. 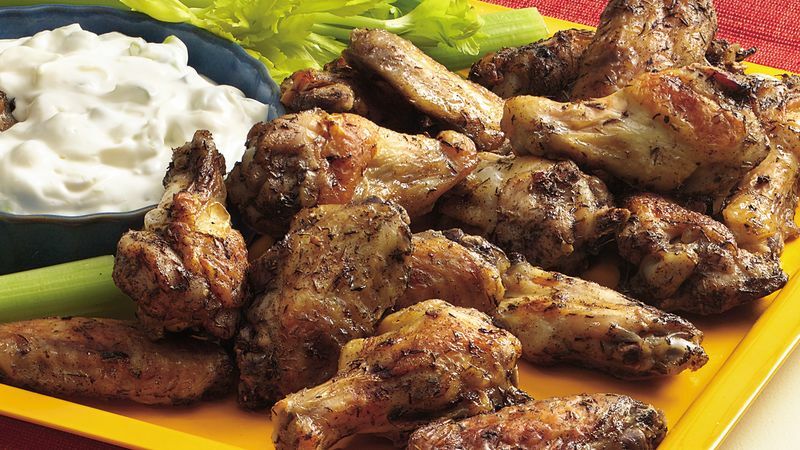 Instead of preparing the marinade for these wings, purchase a jerk marinade or rub to use on the chicken wings. Marinate the wings and bake as directed.